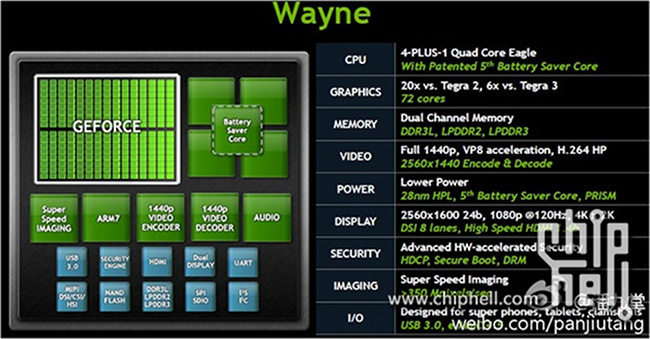 NVIDIA’s next-gen processor, codenamed “Wayne,” may have leaked out in a company slide yesterday. The mobile processor that most of us figure will be dubbed the Tegra 4, will reportedly sport a 72-core GPU, support 1080p (2560×1440) resolutions, and produce 6x the graphical performance of the Tegra 3. It’s quad-core CPU architecture remains somewhat the same, but NVIDIA will now use ARM Cortex A-15 cores. The Tegra 4 will use 28nm process, making it as power efficient as the Snapdragon S4. The slide also mentions something about supporting 4k, USB 3.0, and dual-channel DDR3L memory. Overall, this sounds like a giant step forward for NVIDIA. We’re big fans of the Tegra 3 and the work that NVIDIA puts in to bring gaming to mobile devices, so this sounds like exactly what we were hoping would be next in the Tegra 4. The last rumor we saw suggested that devices could ship in Q1 2013 with the Tegra 4 inside.